Break Loose Farm is an alpaca farm located in Manchester, Maryland owned by Ann & Tony Kaminski. BREAK LOOSE FARM is a family farm in rural Maryland, where we raise Suri alpacas and Cotswold sheep. We are conveniently located on the Mason-Dixon line between Hanover, PA and Manchester, MD. Break Loose Farm started 35 years ago when Ann & Tony decided to move to a farm, where raising their children would provide important lessons about life and responsibility. The hard work and necessary co-operation has been fun, worthwhile, and rewarding for all. We truly enjoy the daily experiences of working with our herd and are continuously learning about these extraordinary animals. We’d love to show you our beautiful animals and would enjoy sharing what we’ve learned with you. BREAK LOOSE FARM is a family farm in rural Maryland, where we raise Suri alpacas and Cotswold sheep. We are conveniently located on the Mason-Dixon line between Hanover, PA and Manchester, MD. Break Loose Farm started 35 years ago when Ann & Tony decided to move to a farm, where raising their children would provide important lessons about life and responsibility. The hard work and necessary co-operation has been fun, worthwhile, and rewarding for all. Ann, who loved crafts, became interested in producing fiber. She experimented with many breeds of sheep but fell in love with Cotswolds because of their lustrous fiber and gentle personalities. We participated in sheep & wool events for over 25 years, selling our fleece, yarn, and other wool products plus freezer lamb. 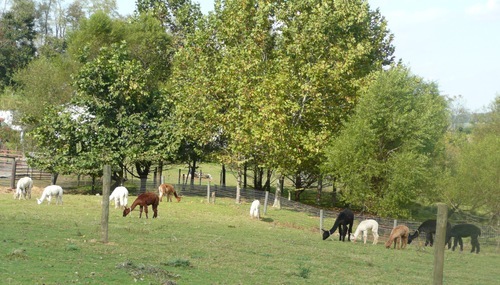 Several years ago we purchased our first Alpacas, four geldings … two Huyacas and two Suris. Ann worked with fiber from these boys but fell in love with the handle, softness and luster of the Suri’s fleeces. She said Suri fleece was just wonderful to work with. Obviously, she was smitten. We acquired our Suri breeding stock, all of whom are registered with ARI. Each alpaca was assessed for conformation, fiber quality, and color. After doing a great deal of research, we realized that alpaca breeding and fiber processing was becoming a whole family enterprise. BREAK LOOSE FARM is operated by Ann & Tony, our daughter, son-in-law and our 2 grandsons. We have decided to concentrate on a small color range, black to medium / dark brown (maroon) and white to light beige & fawn. Our breeding goal is to build our herd with these two color extremes. We truly enjoy the daily experiences of working with our herd and are continuously learning about these extraordinary animals. We’d love to show you our beautiful animals and would enjoy sharing what we’ve learned with you.